In the first article, we discussed how The Force Awakens portrayed Rey and Kylo’s relationship and how it differed from stories that use the ‘enemies to lovers’ trope in key ways. Now, we show why romantic Reylo is incompatible with the story going into Episode IX. In The Last Jedi, Rian Johnson appeared to set up Rey and Kylo in a way that teased the “enemies to allies” trope, arguably to suggest that the story was on that particular trajectory. In the “enemies to allies” trope – and, indeed, in the related but certainly not identical “enemies to lovers trope”- the “evil” character is redeemed early enough in the story (typically in the second act or early in the third act) that both they and the hero(ine) can team up against the Big Bad, who is the true villain of the story in the climax of the third act. In the Thrawn Trilogy (now “Legends”), Mara Jade is solidly Luke Skywalker’s ally well before the climax of the third novel, and they don’t become lovers until many years later. In Avatar the last Airbender, the villain Zuko is redeemed early enough in the third season for the show to have multiple sub-arcs of him building friendships with the other main characters and proving himself a hero prior to the series finale. In Mr. and Mrs. Smith, the titular characters stop trying to kill each other about halfway through the movie and spend the remainder of the film working out their relationship issues while trying to escape the people that want them both dead. Rian, as a director working for an established movie studio, knows these tropes, and he knows that on some level the audience knows them too. In having Kylo, in the second act of the movie, choose to take his master’s place as Supreme Leader over Rey’s offer of companionship and compassion, Rian abruptly subverted the enemies-to-allies trope. To our surprise, we learn that compassion and a sense of belonging – which Vader wanted, and which Rey’s and Kylo’s prior interactions suggested Kylo wanted – is not the key to Kylo’s turn. This is not a fairy tale where a little love and understanding transforms the monster into a man. Indeed, Rey’s shattered naïveté reflects that of the audience; the story did not go the way she thought it would, nor the way we were lead to think it would. (Remember that Rian once called Rey in The Last Jedi an “audience surrogate.”) By teasing the trope, Rian heightened the impact of that plot twist. He wanted the audience to feel just as betrayed as Rey in that scene, because their expectations were undermined. It is commonly argued that the ST is in fact using the “enemies-to-lovers” trope with Rey and Kylo, and that TLJ even confirms this theory. In actuality, due to Rian’s plot twist (among other things), TLJ renders said trope impossible in the context of a three-movie arc. In order to execute this trope, a story must devote a significant amount of time to developing the couple as lovers after they have stopped being enemies to sell the audience on the idea that these two characters are a couple now. Even in Mr. and Mrs. Smith (where the characters were already married and it was abundantly obvious to the audience that they were in love with each other), the narrative took time after the characters had stopped fighting against each other to show them working through their relationship issues and growing together as a couple. As of the end of TLJ / the beginning of Episode IX, Kylo is officially the “Big Bad.” There isn’t a character in the series that could replace Kylo in this role in a way that would produce an interesting level of physical and emotional conflict for the movie. Once Rey and Kylo stop fighting there isn’t a bigger villain for them to face together. We’ve seen Kylo throw Hux around like a rag-doll. Hux knows that the only chance he has against Kylo is if Kylo is somehow incapacitated. 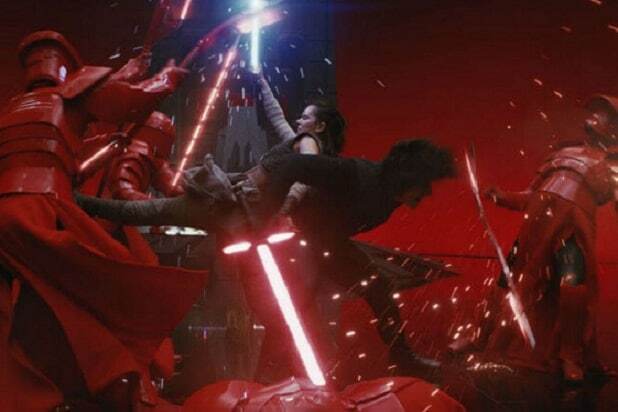 Any fight scene that featured Rey and Kylo vs. Hux – or even Hux and his cronies, a la TLJ’s guard fight – would be over in seconds. Additionally, Rey has never met Hux or Phasma or any other First Order officers so there would be no emotional weight to her conflict with any of them. Additionally, introducing a new villain this late in the game has its own set of problems. Bringing in a new villain, one that hasn’t been set up by the previous narrative, would be incredibly forced, with the lack of proper narrative introduction leading to a very low level of emotional conflict between the characters. This applies to the Knights of Ren as well. We have been introduced to them in concept during Rey’s Forceback, but we still have no real idea who they are. Rey has yet to truly meet the Knights of Ren so any conflict between them and Rey would lack a strong emotional component. Kylo is also the Master of the Knights of Ren, which strongly implies that he’s the most powerful among them. Their lack of introduction and implied inferiority make the Knights of Ren really good candidates for henchmen, but really poor candidates for the role of main villain. Of all the remaining villains we have been introduced to in the Sequel Trilogy, there isn’t anyone left that could take Kylo’s place as villain that would be both a credible threat and also have some level of emotional conflict with Rey. Ultimately, once Kylo and Rey stop fighting the story is effectively over because the biggest conflict of the trilogy is over. The lack of a bigger threat means that it is impossible for Kylo to be redeemed prior to the climax of the film. The climax, by definition, is where the major conflict is resolved and Kylo being redeemed resolves the major conflict. After the climax there is simply too little narrative space to effectively develop his and Rey’s relationship to the point where he is considered – by Hollywood standards, which ostensibly reflect those of mainstream society – a “suitable” love interest for the heroine. (Think of the TV series with villains who are redeemed and hook up with the lead; now, think of just how much screen time was devoted to both redeeming the villain and subsequently establishing a positive dynamic between him and the heroine…) That can’t happen because Kylo is now the Big Bad. There isn’t enough time after the climax to do that. Drawing the movie out much longer after the conflict resolves risks criticism that the movie dragged on longer than it should have, as was the case with The Return of the King upon its release. Episodic Star Wars movies typically end less than ten minutes after the end of the climax of the movie. That simply isn’t enough time for two characters to go from duking it out with the fate of the galaxy at stake to being a loving couple that is going to live happily ever after and expect the audience to believe it. Remember, the reason Rey is on bad terms with Kylo at the end of The Last Jedi is that he’s trying to kill her friends in the Resistance (“No quarter, no prisoners.”), and tried to get her to turn her back on them while they died. She isn’t going to go running to his arms while he’s still actively trying to kill her friends. So there couldn’t be any romance prior to Kylo’s redemption and Kylo can’t be redeemed prior to the end of the climax because there’s no one to take his place as the Big Bad. And even if he is redeemed at the climax, there’s no time after that to develop their relationship as romantic or sell the audience on it. It would be narrative whiplash. Conversely dragging the movie out long enough beyond the climax to build and establish Rey and Kylo as a romantic couple and work out all of their interpersonal issues would wreck the pacing of the movie as it would essentially require a separate story to be told in its entirety after all of the other storylines had already wrapped up. If IX did go the route of having Rey and Kylo becoming a couple immediately after Kylo’s redemption at the climax of the film, it faces another problem. It would be giving the impression that the villain had “won.” “Getting the girl” and “living happily ever after” are typically rewards given to victorious heroes not defeated villains. Villains that are redeemed early often do get happy endings because they have had time in the story to prove themselves heroes and win the forgiveness of the audience (i.e. Prince Zuko). Villains that are redeemed late in the story typically have tragic ends (i.e. Darth Vader, the Phantom of the Opera). This is because it is easier for that character to win the forgiveness of the audience in a short period of time if the audience also feels sorry for them and feels they have been adequately punished for their misdeeds. Giving the villain everything they want immediately after their redemption makes it harder for the audience to forgive the former villain because the audience won’t feel as though justice has been properly served. This is true even for extremely sympathetic villains. This is why the Phantom of the Opera doesn’t end with the Phantom marrying Christine. Keeping Kylo as the main villain of IX allows the film to have an intense deeply personal level of conflict between the protagonist and antagonist. Pairing Rey with a heroic character would allow the romantic relationship to be naturally developed during the rising action portion of the film. This allows the romantic plot thread to wrap up at the same time as all of the other plot threads without feeling forced. The movie could then be conventionally paced and wouldn’t need to drag on long after the climax is over. (This could also be achieved by giving Rey no romantic plot at all.) Giving Kylo a tragic or bittersweet end after his redemption allows the audience to sympathize with him even more than they already do. A tragic or bittersweet end also allows the audience to forgive Kylo more easily than if he had been given a happy ending without him spending enough time on the good side to have that happy ending feel earned. Replace Kylo as the Big Bad which would replace an intense deeply personal conflict between two powerful characters with a much less intense impersonal conflict between two powerful characters and a pushover or hamfistedly introducing a new main villain in the third act. Wait until after the end of the climax to tell the love story which would result in one of the most terribly paced movies ever made. End the film by giving the villain everything he wants immediately after he finally says he’s sorry for all the horrible things he’s done without giving him time after that to prove himself a worthy love interest. Regardless of how you feel about JJ Abrams as a filmmaker, the above are not things that he tends to do in his movies. His films have villains that aren’t pushovers and have interesting levels of emotional conflict. His movies tend to have fairly short run times and are conventionally paced. His TV shows are one thing, but his movies tend to have conventional feel good endings where the good guys win and the bad guys get their just desserts. TLDR: A Rey/Kylo romance isn’t going to happen in Episode IX unless J.J. Abrams makes decisions that, strictly from a filmmaking perspective, would be objectively bad. He has no history of making similar decision in his past films, so it is highly unlikely he will do so now. Like this? Follow us on Facebook, Twitter, Tumblr or here on WordPress! You are so stupid. Reylo will happen get over yourself! I think we hit a nerve!